SEOUL, Sept. 4 (Yonhap) — During the Joseon Dynasty (1932-1910), men and women who remained single by the age of around 20 were believed to bring bad luck to the nation. As the country’s fate seems to slide and a drought continues for months, prince Lee Yul orders all those “old” men and women to tie the knot to turn the nation’s fortune around. 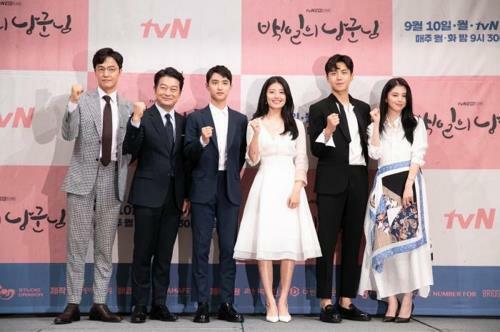 The upcoming television series “Dear Husband of 100 Days,” also known as “100 Days My Prince,” set in the period, features the interesting love story between an unlikely couple: the prince, who loses his memory following an accident and gets to marry the country’s oldest single woman, who doesn’t know her husband’s true identity and thinks him useless and completely out of touch with reality. Popular K-pop boy group EXO’s Do Kyung-soo, better known by his stage name D.O., plays the prince, and Nam Ji-hyun takes the role of the bride, Hong Sim. The romantic comedy centers around the prince’s 100-day adventure outside the palace before he regains his memory and returns to where he belongs. As it was Do’s first role in a period drama, the singer-actor said he was very nervous in the beginning. “I accepted the role as it was a new challenge for me. Acting in (traditional Korean attire) and speaking in an accent were a bit hard. They were new experiences,” he told reporters during a press event Tuesday in Seoul. The new series is expected to play an important role in shaping the career landscape for the singer who has been successfully expanding his career into the small and big screens over the past few years. The 16-part drama entered production in April and recently finished filming. Director Lee Jong-jae said he was happy that the production finished without a hitch. “I was also new to producing a period drama. Every actor showed great performances. They delivered emotional scenes so well, which I emphasized the most. I am very satisfied with it,” he said. Nam Ji-hyun of MBC’s “Shopaholic Louis” said her multidimensional character attracted her to the show. “The character has many interesting aspects. As I practiced a lot with Do before actual shooting, we became comfortable around each other. I had a fun time acting with him,” she said.